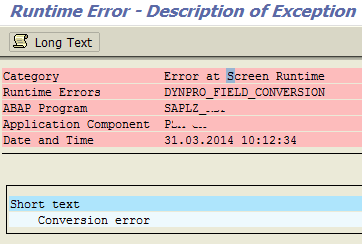 If you get the following DYNPRO_FIELD_CONVERSION error when you access your table maintenance via transaction SM30 it is probably due to negative values within your table fields. These may be stored in currency fields and be perfectly valid but SAP does not seem to be able to deal with them if you create your table maintenance directly on the database table, see OSS Note 329857. The solution is basically to create a Maintenance View for your table via tcode SE11 and then create your table maintenance based on this. You don’t have to do anything clever in the View just add the single table and all its fields. Then create the tab maint from within the view. Then simply enter the view name via SM30 instead of the table name…simples!! !